How is everyone going with their Christmas preparations? We are all set I think, presents wrapped, grocery shopping done, cookies baked and ready for Santa. Just one more day of work and then I have a week off where I can enjoy the heat and swim in the pool - I love our hot Aussie Christmases. Yippee. So I thought I would try out doing an ikat design with Christmas colours. This looked better in my head, well not necessarily better, but definitely different. 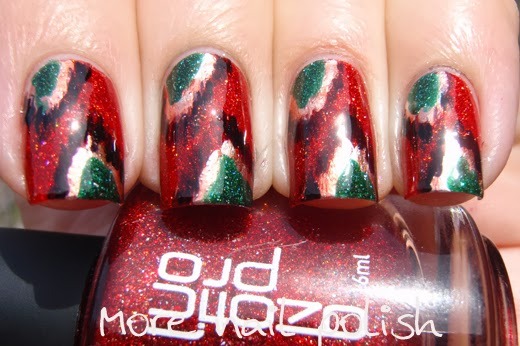 The base is Ozoitc 621, I then did the rough triangle shapes with OPI Push and Shove. Then I put the green on top of that, which is PP Kryptonite. Lastly I did the rough scratchy lines using black. When I applied top coat, the red from 621 bled over the top of OPI Push and Shove, making it look much more rose tone gold than silver. 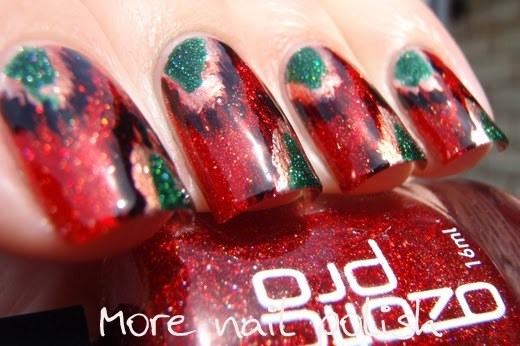 It definitely different, a very edgy Christmas look without doing the standard stamping of snowflakes and christmas trees. 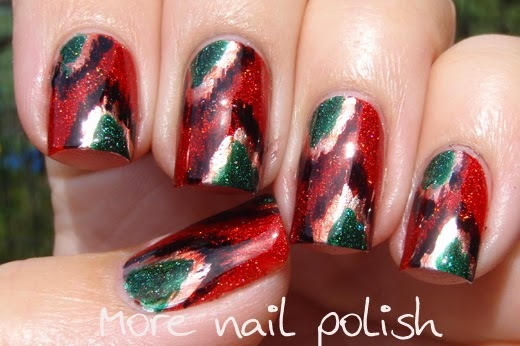 I still haven't decided what is going on my nails for Christmas day though, I better get my thinking cap on. Beautiful! 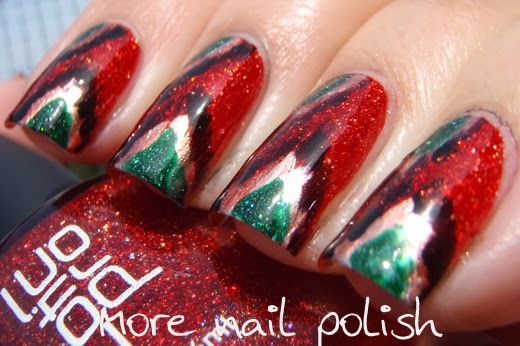 Your nails look just perfect for this year's Christmas! I like that a lot, and I'm envious of your sunny Christmas!